Mrs. Jordan was reputedly the greatest comic actress of her day. In 1790 she became the mistress of Prince William, later William IV, and bore him ten children. They lived happily together for twenty years until William was persuaded to leave her in favour of a suitable bride. In 1815 she retired to France, heavily in debt. Mrs Jordan often sat for Hoppner. 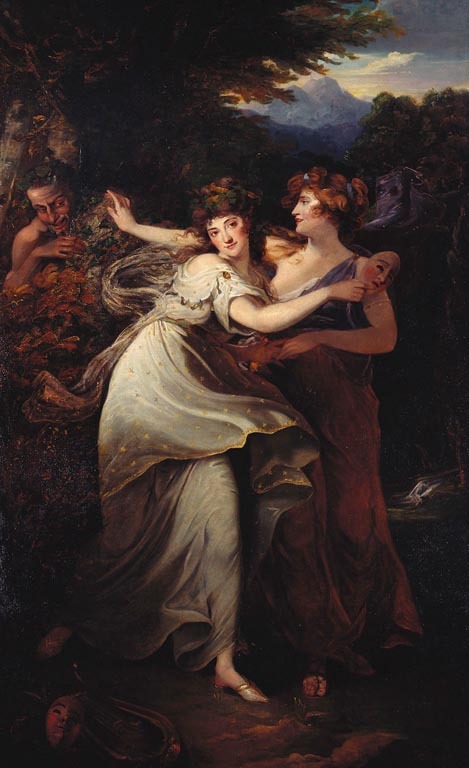 Here she plays the character of Thalia, the muse of Comedy, holding her mask, flying into the arms of Euphrosyne away from the advances of a satyr. The painting was probably acquired by William IV who even after they had parted wanted ‘to have all the pictures of Mrs. Jordan’.